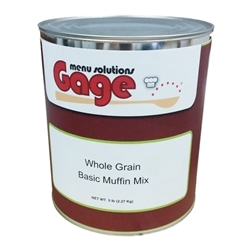 Whole Grain Basic Muffins, simply add milk or water! Ingredients: stone ground whole wheat flour, sugar, enriched wheat flour, vegetable shortening, nonfat dry milk, whole egg powder, monocalcium phohsphate, salt, artificial flavor. Made in a facility that also processes eggs, milk, wheat and soy. Fill well greased muffin tins 1/2 full with batter and bake at 375°F for 20 - 30 minutes or until light golden brown.